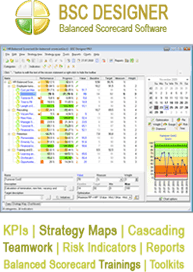 Why measure productivity of business? This simple question seems rather easy at a first glance. But ridiculously as it may seem, there are so many business owners who have no answer to this question. For example, business may bring good money to its owner, and he or she will be completely satisfied with the situation. But in fact, the business may bring wise of three times as much as it does now. It’s not a secret that the ultimate goal of any business is making money. But that is not all. Top managers and business owners have to make the most effective use of available material and nonmaterial resources. This is where evaluation of business productivity will help so much. Modern big time business cannot function without having a proper strategy. To be correct, such a business will survive for several years and then will be completely wiped out by competitors. Running business without a strategy is like driving a car to the wrong destination hoping that you’ll get to the place you expected to get. Strategy is vision of possible problems and obstacles on the way of implementation of strategic goals. These problems are solved in advance, before they actually appeared, the company will have a serious competitive advantage in the market. But very often strategy has nothing of very little to do with what company is actually doing to achieve strategic goals. 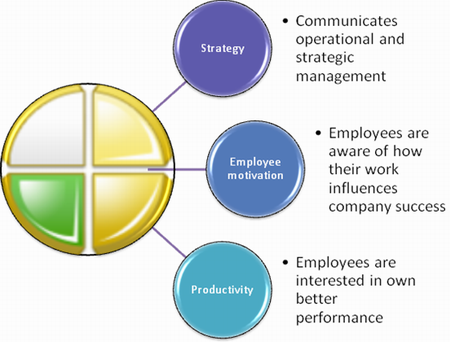 This gap between strategic management and operational activity is to be bridged. 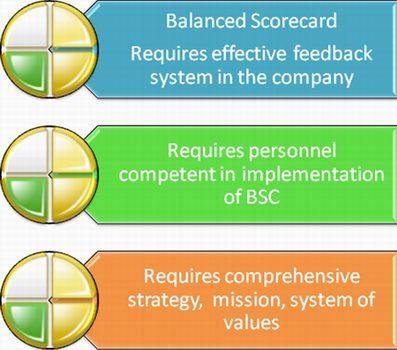 Balanced Scorecard is such a tool that makes it possible to communicate operational and strategic management and visualize the strategy. Strategy visualization makes it possible to see cause and effect ties between goals and measures. In other words, every employee in the company will understand how his work and his mistakes influence company success. With the help of balanced scorecard top managers and shareholders will see where the company driving and what needs to be improved to achieve strategic goals and withstand tough competition in the market. Implementation of balanced scorecard is a continuous process, but already at the initial stages it will be possible to measure productivity of business. It may turn out that employees may attract more customers, introduce more products to the market or perform aggressive marketing campaigns. Balanced Scorecard should not be confused with the strategy itself, as it does a substitute the strategy but transfer as it into real actions which need to be taken.